The Savcili Thrust Fault (Kιrsehir, Central Anatolia): a backthrust fault, a suture zone or a secondary fracture in an extensional regime? Abstract: The Gümüshane Mesozoic Basin is characterized by Lower–Middle Jurassic volcanic-siliciclastic sediments (Senköy Formation), Upper Jurassic–Cenomanian platform carbonates (Berdiga Formation) and Upper Cretaceous turbidites (Kermutdere Formation). Four extensional periods (Lias–Dogger, Turonian–Coniacian, Late Campanian (?) and Early (?) Maastrichtian) separated by two quiet tectonic periods (early Malm–Cenomanian and Santonian–Campanian) have been defined in this sequence. The previous studies suggested that Mesozoic basins only formed by extensional movements in the middle Cretaceous. Three extensional periods seperated by two quiet periods from the Cenomanian to the end of the Maastrichtian in Gümüshane and NE Turkey were firstly proved by sedimentological findings in this study. The definition of these periods depends on features such as (1) neptunian dykes in different levels, (2) shallow marine limestone, (3) thinning-and-fining-upward sequences, (4) mixed faunal assemblages, (5) micro-turbiditic structures, (6) syn-sedimentary fault, (7) grabens, half-grabens, (8) pelagic limestone, (9) calciturbidites, (10) laterally and vertically rapid changes of the thickness and facies, (11) platform-to-basin transition and (12) monogenic breccias. Abstract: The Upper Aptian to Lower Albian Tata Limestone Formation consisting of brown-grey bioclastic crinoidal limestone presumably represents the first unconformable formation, which recorded early deformation events of the Alpine cycle. The base of the Tata Limestone is affected by erosional features accompanied by significant breccia bodies. Reconstruction of the paleomorphology of the basin bottom supported by paleoecological (e.g. water depth) data shows (in the recent orientation) at least five northwest–southeast trending zones with significant erosional features and accompanied by coarse-grained graded breccia in a more clayey matrix (e.g. Cseh-1 borehole). These elevations were uplifted above deeper basins filled with crinoidal limestone. The geometry of the uplifted units is asymmetrical, anticline-like and the deeper depressions have a syncline-like structure. According to previous works to the anticline-like morphology of the uplifted zones and to the transport direction of the coarse breccia clasts, these uplifted units were possibly formed by thrusting, in a compressional regime. The differences in the thickness of the crinoidal limestone and the breccia interbeds show synsedimentary character of these movements. In the borehole Cseh-1, large limestone fragments appear already in the Sümeg Marl Formation and they are present throughout all the Tata Limestone sequence. This fact indicates that the tectonic movements started in the Barremian and continued during the whole Aptian. 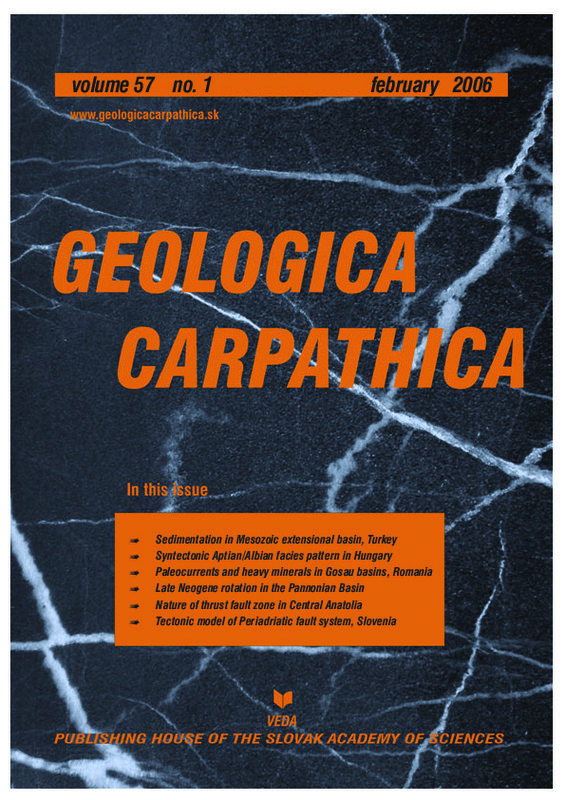 Abstract: Heavy mineral assemblages from profiles of Upper Cretaceous Gosau sediments of the Apuseni Mts (Romania) help to reveal source areas and to get clues about geodynamic processes leading to erosion of distinct rocks in the surrounding geological units. The samples from the Lower Gosau Subgroup reflect no distinct heavy mineral predominance: metamorphic and magmatic sources are largely balanced. The Upper Gosau Subgroup is characterized by an increase in minerals derived from metamorphic rocks. Increasing amounts of apatite reflect the onset of the banatite magmatism during Campanian time. Cr-spinel was found in most of the profiles and in different stratigraphic horizons, reflecting erosion of obducted oceanic crust situated south and southeast of the Gosau basin (in present-day coordinates). Paleocurrents indicate that sedimentary supply was provided from both sides of the elongated forearc basin. On the basis of paleocurrent indicators and heavy mineral spectra we propose a scenario with erosion of a forearc ridge on the one side of the basin and a crystalline basement on the other. The increase in metamorphic heavy minerals indicates enhanced erosion in the uplifting crystalline hinterland (mainly composed of the Bihor Autochthonous Unit) during sedimentation of the Upper Gosau Subgroup. Abstract: Earlier paleomagnetic studies suggested that counterclockwise rotating Adriatic microplate could have triggered the youngest rotations in the Hrvatsko Zagorje area (in the Slavonian Mts) and in the Mura-Zala Depression. Since the named areas are located quite far from the Eastern Adriatic coast, we decided to study the Krsko and Karlovac Basins, which are situated in-between. From the collected 12 paleomagnetic localities (Badenian through Pontian sediments) ten yielded good paleomagnetic directions as a result of laboratory processing and statistical evaluation. They definitely point to the counterclockwise rotation of the area in post Early Pontian times. The angle of the rotation is about 20° (D=337°, I=50°, k=48, α95=10°). Thus, we have found a missing tectonic link from the Hrvatsko Zagorje, Slavonian Mts and the Mura–Zala Basins to the Adriatic microplate and collected further paleomagnetic evidence for end of Miocene or even younger important tectonic movements in the South Pannonian Basin. Abstract: Large exposures of granitic and metamorphic rocks characterize the geology of Central Anatolia, in Turkey. These basement rocks crop out mainly between the Tuz Gölü and Ecemis fault zones, two major fractures of strike-slip fault character. During the Neogene, detachment faulting along the Tuz Gölü Fault (TGF) zone caused the deposition of several thousand meters of sediments in the large intracontinental Tuz Gölü Basin. In the western parts of Central Anatolia and near Kιrsehir town, another fracture zone runs almost parallel to the SE-trending TGF zone, separated from the TGF by a narrow (~30 km) and rectangular granitic belt. Along this fracture known as the Savcιlι Thrust Fault (STF), metamorphic and plutonic rocks overthrust middle Eocene detrital rocks of the sedimentary cover along a relatively narrow (~100 m) crushing zone. In some previous works, this structure is presented as a backthrust of the Anatolian block, or a suture zone along which two continental Central Anatolian blocks were amalgamated. Recent detailed mineral exploration studies reveal that the area at the north of the STF comprises several low-angle normal faults along the surfaces of which the Eocene and the underlying metamorphic rocks moved southwards until they were juxtaposed to southern granitic rocks along steeply or moderately dipping contacts. The fault surfaces are several km long, slips of a few kilometers are clear and ductile deformation is observed in the Eocene clastic rocks. Immediately to the north of the STF, Eocene rocks are asymmetrically folded with a southern vergence, a displacement sense not compatible with the northerly movement observed at the STF zone and suggesting a causal relationship between thrusting and normal faulting. A possible explanation of this extension may be the southwards tilting of the foreland due to the northwards overthrusting and the following gravitational movements. The folding style in the foreland and the very narrow width of the thrust zone, however, preclude such a crustal loading to induce extension in the foreland. In the Savcιlι area where the thrust fault is observed, we do not see any evidence to account for crustal shortening, as it should be observed in the vicinity of a major compressional structure as previously advanced. How this thrust formed in an extensional regime and how this post-middle Eocene crustal extension is associated with the southern Neogene Tuz Gölü Fault zone remain to be explored. Abstract: We present GPS-derived 6 year (1996–2002) displacements of 9 sites in northeastern Slovenia, spanning across the faults of the Periadriatic fault (PAF) system. Site velocities relative to the stable Eurasian plate, while close to or within the uncertainty limits, indicate predominately N- to NNE-directed movements in the range from 0.5 to 2 mm/yr, which is consistent with the previously published continuous and episodic GPS observations from the region. Our results support the recent idea about the ongoing eastward extrusion of the Eastern Alpine domain and confirm that the PAF system could represent the dextral southern boundary of the extruding unit. However, the deformation in the Slovenian part of the PAF system is not limited to a single strike-slip zone, but is accommodated within the larger area. Measurable dextral displacements in the range of ~1 mm/yr exist on the Sava and Labot (Lavanttal) faults of the PAF system. No dextral displacements were observed along the eastern continuation of the Sava fault, which suggests southward displacement transfer and possibly absorption of deformation in the transpressive Sava Folds foldbelt situated south of the fault. Ongoing thrusting of the Northern Karavanke unit north of the PAF implies active transpression along the main PAF zone, whereas the region between the PAF and the Sava fault is apparently deformed transtensionally.